which Ruben calculated would give 172mm travel, over the standard 160mm. I'm all for more travel as it essentially weighs nothing, and my usual trails often ask for downhill capabilities. The bike is named after the 'Madonna Della Guardia' trail, a stalwart in the Finale Ligure riding and racing scene, so it was appropriate to put this bike through its paces on home turf.The frame kit (frame, Fox DPX2 Factory shock, headset, axle and frame protection) is available for €2690, with the option of having a Fox Float X2 or DHX2 shock for a €150 surcharge. Now, two complete bikes are also available, both are built using a 170mm Fox 36 GRIP2 fork, DPX2 Factory shock, Stans Flow rims and Maxxis tires. €4990 for the 'Factory build' and €6490 'XTR build.' These prices include German VAT at 19%, so purchases from outside the EU will be reduced, but local taxes will apply. Currently, the Madonna can be shipped worldwide, with the exception of the USA and Canada (this should be an option in the very near-future). To some, this might 'only' be an expensive aluminum frame, but it is a very well thought out piece of design, with more features than you can shake an aluminum tube at. Rather than solely thinking about performance and weight on paper, Raaw were aiming for durability and functionality as well. These durability goals are obvious when taking a look at the bearings and pivot hardware that RAAW chose. Large 52mm bearings are used at the main pivot, which is the same size that is used in the lower cup of a tapered headset. For the rest of the pivot bearings, 28mm bearings are used, including at the upper shock mount, in order to reduce friction (this also means one spare could fit any pivot). In addition, with the exception of the main pivot, all other hardware only requires a 5mm hex key to work on. These decisions are something that aggressive, high mileage riders who slap a lot of turns will approve of, as changing bearings every month or two soon becomes wearing.Integrated storage was something else Raaw were aiming for, similar to Specialized's SWAT system, to make it easier to carry everything you need without a bag. There is space for a bottle cage and full-size water bottle, along with a recess in the down tube for shock clearance and spare tube storage, with a strap also provided. Due to the way the top tube is constructed using two separate aluminum tubes, there is also a hidden pocket in the top tube and specially made pouch with press-stud for easy access. This is big enough to hold cash, keys, spare chain links, zip ties, and CO2 inflator.Other details are the hollow forged frame parts, which reduce weight without leaving external pockets for mud to gather. A threaded bottom bracket, external cable routing and differently sized brake mounts that do away with adapters. Geometry & Sizing The Madonna is only available in sizes medium, large and XL, which is probably sensible considering the amount of travel on tap and the big wheels could potentially cause problems for shorter riders.The geometry is certainly modern, but also balanced. On a standard XL bike with 160mm fork, there is 500mm of reach, a 65° head angle, 35mm bottom bracket drop, 78.2° seat tube angle and 450 mm chainstay, adding up to a 1291mm wheelbase. 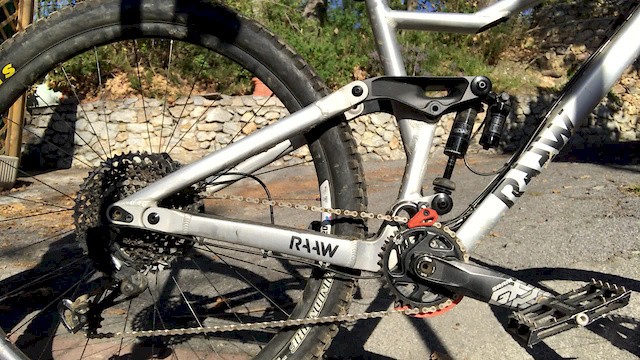 Unlike most brands, Raaw opted for proportional length chainstays, with the medium using 440mm chainstays, the large 445mm chainstays and the 450mm chain stays on the XL. This should keep the front to rear wheel weight balance more consistent between the sizes.With the 180mm travel Lyrik fork, the axle to crown height is 24mm longer than the 160mm travel Fox 36 it was designed around; these numbers change slightly to the ones on the geometry chart above. The reach reduces to 489 mm, head angle slackens to 64°, bottom bracket rises to -25mm drop, the seat tube slackens to 77.2° and the wheelbase adds up to 1297 mm. Suspension Design The four-bar linkage suspension layout features a huge rocker link, delivering a consistently growing leverage ratio that ends at just over 20% of progression. This progression leads to great support and uses the 160mm of travel efficiently. The main pivot is designed around a one-by drivetrain, delivering superb pedaling efficiency, even when sprinting.A high starting leverage ratio combined with ball bearings on the shock pivots makes the suspension supple from the start which promises to track the ground and create grip. The influence of braking on the suspension is designed to be very active at the beginning of the travel, allowing impacts to be absorbed while braking. Deeper in the travel the influence of braking increases and gives the rider slightly more stable geometry when things get rowdy. Soon there will be a rocker-link for riders over 90-95 kg. The geo of this rocker link has been tweaked to use 65mm of stroke instead of 60mm to get 160mm of travel. This lowers the leverage ratio, which reduces the air pressure or spring rate needed and puts less force on the damping. This will be available in March as an upgrade for €200 and sometime next year as an option when purchasing a frame. As already mentioned, this bike was custom built for the review as no complete bikes were available at the time. SRAM provided the majority of the parts, with a 180mm travel Lyrik RC2 42mm offset fork, and longer stroke Super Deluxe RT with a TwistLoc remote lockout shock providing 12mm more travel than standard at 172 mm. There is also a SRAM GX Eagle drivetrain, Code RSC brakes with 200/180mm rotors, a Truvativ cockpit, a 170mm Reverb dropper post, Newmen E30 wheels, and I mostly used Schwalbe's Eddy Current eMTB tires front and rear. Weight: I'm expecting many Pinkbiker's to read the weight figures in the details box at the start of this article and go straight to the comments to moan about the 37 lb weight of this bike, saying that 'X-bike weighs 27lbs and can be raced blah blah blah.' But this needs to be put into context. First, this machine has been hammered for months and has not missed a single beat, and it survived a brutal EWS race where I passed rider after rider with mechanicals issues. I do not believe there are many racers that finish one of these events with a complete, race ready bike that weighs less than 33lbs, but am happy to be proven wrong. The weight includes all alloy parts, 29" x 2.5" DH casing Maxxis Minion tires, a coil shock with a lockout, chainguide, mid-range GX Eagle, 170mm dropper post and the OneUp tool. The frame weight of 3.8kg is around a kilo more than a Scott Ransom for example, so if you wanted to, you could get this bike down around the 30 lb mark. I prefer to pedal a few extra pounds and not carry the bike down the trail. Climbing The Raaw climbs extremely well for a bike in this category, and flies from the start. I think this bike is more proof that the riders position in relation to the bottom bracket can be more important than the suspension design itself for pedaling efficiency. I measured an actual seat angle of 76º at my preferred saddle height of 74cm from the BB center, this makes it one of the steepest on the market without getting confused about different manufacturers' measurements. Despite people saying my knees will explode, they, along with my lower back and hips never felt better - even riding back along the beachfront after completing the 52km EWS race in Finale I was upright and comfortable.Standing up and putting down the power, the Raaw still kept pushing forward with little lag despite the long travel and 'scary' numbers on the weight scale. It also provided great uphill traction, with its only climbing downside being the low bottom bracket that makes pedal strikes more frequent. This is less of a problem when you're fresh, accurate, and on top of your game, but it did cause me a few problems when my eyes and heart rate were in the red when racing - I completely messed up two climbs by striking pedals and losing all momentum and a lot of time at the EWS. I would really look for something shorter than the 170mm cranks I chose to improve ground clearance on technical climbs.The Twistloc remote did help with this by increasing the ride height, firming things up, but still giving good small bump compliance and grip. This is easily the best lockout system on the market and improved the climbing of the Raaw even further. Firming the suspension up by twisting the grip is easy at the bottom of the climbs, but can be slightly more difficult if you press the PopLoc button when already committed to a descent and holding on for dear-life – you need to release your grip slightly to let it rotate back to the open position but this becomes natural quickly. There's barely anything that got in the way of the Raaw on the way back down the hill. Big wheels and lots of travel meant it could take on everything with ease and I would be happy to take this bike to many full-on downhill tracks. The coil sprung suspension was superbly supple off the top, giving great traction and a smooth ride. The rear suspension had support in all the right places and plenty in reserve for the biggest of hits.The low bottom bracket gave a secure feeling and placed me in the bike, rather than on top of it. This also helps to carve corners but being so low does slow down the switch between directions somewhat. The downside of a steep seat angle, which becomes clear after riding downhill bikes with more relaxed or set-back saddles, is that the seat is getting in the way between your thighs more - the longer 170mm Reverb helped to get it out of the way, but I wouldn't say no to 200mm of drop.Overall, the Raaw is an awesome machine that really can do it all. If I was nitpicking I would raise the bottom bracket slightly. I proved this was my preference by running a 500lb spring to raise the dynamic ride height, giving more breathing space when descending and climbing through rock sections, and sped up changes of direction; the Raaw has plenty of stability so raising the bike a little shouldn't have any negative effects. Storage: It was really useful having the little storage pockets on the bike, the OneUp EDC, and a bottle cage mount. I really like having everything on the bike, so that you can grab it from the shedand just get straight on the trail without checking that you have everything you need in a pack. OneUp EDC: This tool stored away in the steerer tube was used many times, and it's quick and easy to use for small adjustments and repairs. Threading the steerer tube seems like a faff, but once done it does away with those silly star-nuts for good. If I had a collection of my own bikes, I would thread the steerer on each one and use the lockring headset cap (includes stem spacer and the lower steerer bung) which costs €20, then the tool can easily be transferred between bikes in seconds. Double-sealed bearings: Even after months of use, racing, washing, riding in bad conditions, I popped off the double-sealed bearing caps to be presented by completely clean and smooth running bearings. GX Eagle: I'll never be convinced that hanging a derailleur off the back of a bike is the final solution for the type of (careless and often imprecise) riding I do, but, in this drivetrain's defense, it performed smoothly throughout the duration of the test. Months and months of riding only resulted in a few tweaks being made to the cable tension and limit adjusters. RockShox Suspension: The Super Deluxe and Lyrik also performed without issue. There may be dampers that can give you marginally better performance, but these units are the best set-and-forget on the market. Despite the limited adjustment, they do everything that nearly anybody could want with no fuss and great reliability – perfect for riders who want to shred more than tweak dials. Is this the bike for you? If you are looking for a great all-rounder and don't want to look like everybody else at the trailhead on their generic machines, the Madonna could be for you. It's a fantastic pedaler and descender, with attention to details that many of the big brands fail to deliver. Visit the high-res gallery for more images from this review. Watch some pre World Cup season action with a load of your favourite riders. Does Certified Pre-Owned make sense for bikes?